Not a bad NCAA meet for Wisconsin’s Kelsey Card. After finishing fourth in the shot put on Wednesday, she marched into the discus ring on Saturday and hammered out three throws over 63 meters. 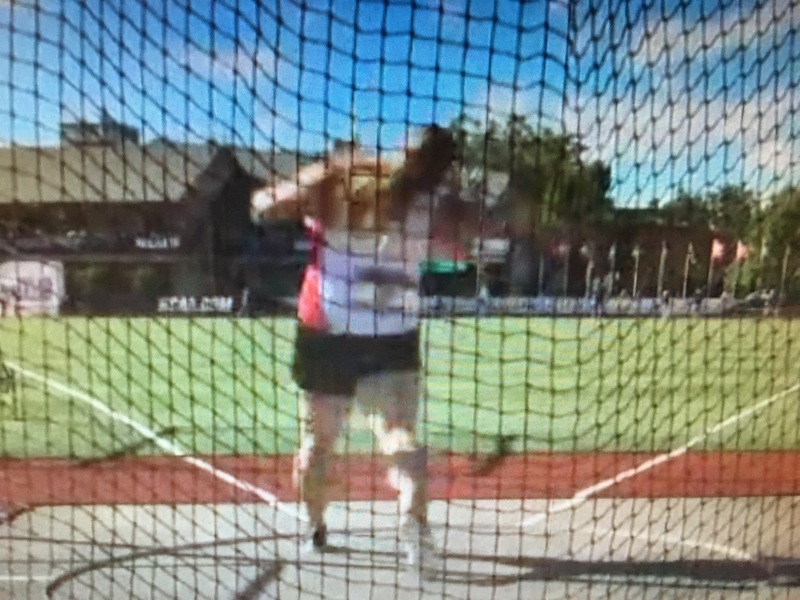 Her fifth-round toss of 63.52m was two meters farther than anything the rest of the field could muster. Afterwards, Badgers throws coach Dave Astrauskas kindly agreed to go through a frame-by-frame analysis of Kelsey’s big toss. 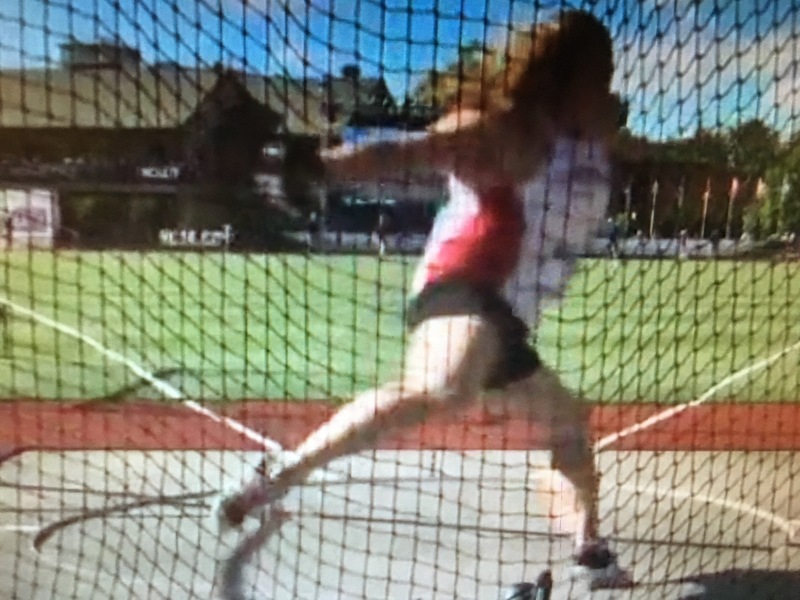 I just watched the video of the NCAA discus final and Kelsey was like a blonde assassin. Other throwers kept inching closer to her, and she just stepped into the ring three times and cool like a cucumber knocked out 63-meter throws. Was she always like that? Can you talk a bit about the arc of her career? What qualities did she show up on campus with four years ago and what has she developed over time? I had a conversation with Kelsey prior to the discus competition which was basically about how Kelsey could not afford to be passive, but needed to be the aggressor in the competition. Her game plan was to go after the first throw, but at the same time make it look/feel as easy as possible to ensure six throws. After the first throw, the plan was for Kelsey to go after the remaining five with everything while staying within herself. In round one, we were shooting for high 57m ended up getting 59.50m. 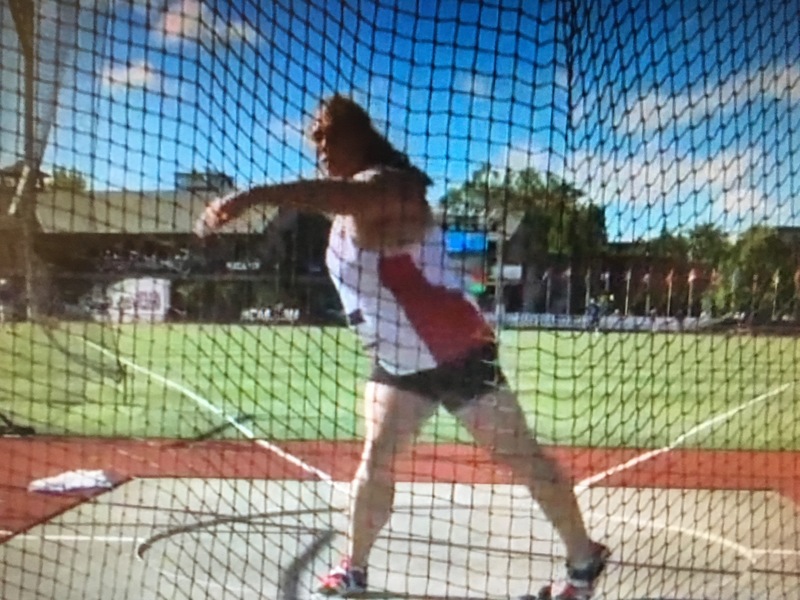 In between prelims and finals she went to the tent outside the stadium and we met and the plan was to again go after each of the remaining throws the right way – with the lower half. Kelsey has not always been the aggressor in competition, but has always been a competitor while at Wisconsin. She historically has been one who generally starts off slow and builds throughout the competition. I cannot recall a competition where her first throw has been her best performance of the day. We continue to work on our round one efforts. Over the years I think the main thing she has learned is that big throws come from executing the proper technique, which as a result create the proper positions at which she can generate force. When Kelsey showed up on campus five years ago, I noticed several traits. First, I saw right away that Kelsey knows how to deliver an implement whether it be a shot, discus, weight, hammer, discus tool, bowling pin, bat, etc. Second, she is one of the most coachable athletes that I have had. Over her time at Wisconsin she has worked with several of my throws volunteers and they’ve always indicated what a joy she is to work with. Third, I noticed her kinesthetic awareness. She has complete control of her body and extremities and can react to a cue and make an adjustment within 1-2 attempts. Lastly, she does not like to lose. I remember her first indoor meet at Wisconsin and she PR’d in the shot and placed 3rd, but was really angry with herself that she lost to two other girls on our team. Let’s talk some technique. 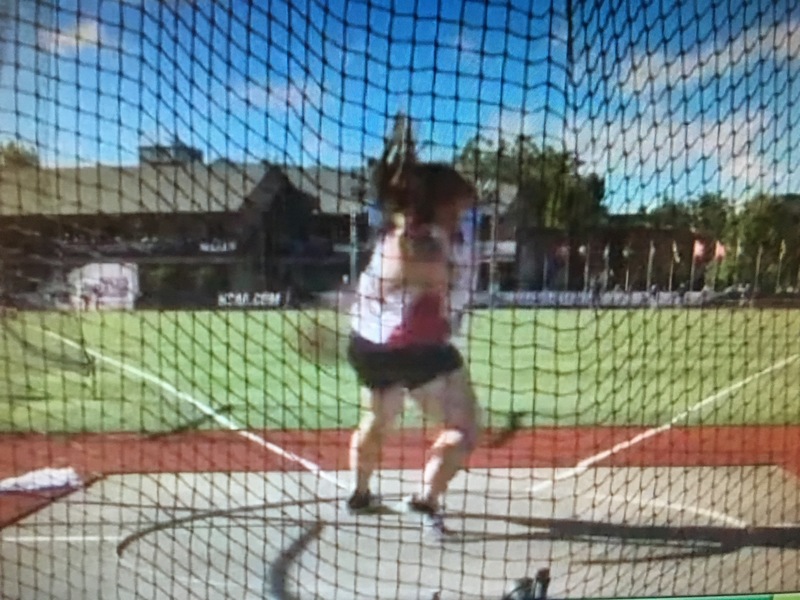 Here is Kelsey’s wind on her 5th throw in Eugene. Compared to a lot of discus throwers, it is a pretty abbreviated movement. Can you comment on that? I feel the wind in the discus is all about what feels good to each individual athlete similar to a windup of a baseball pitcher. 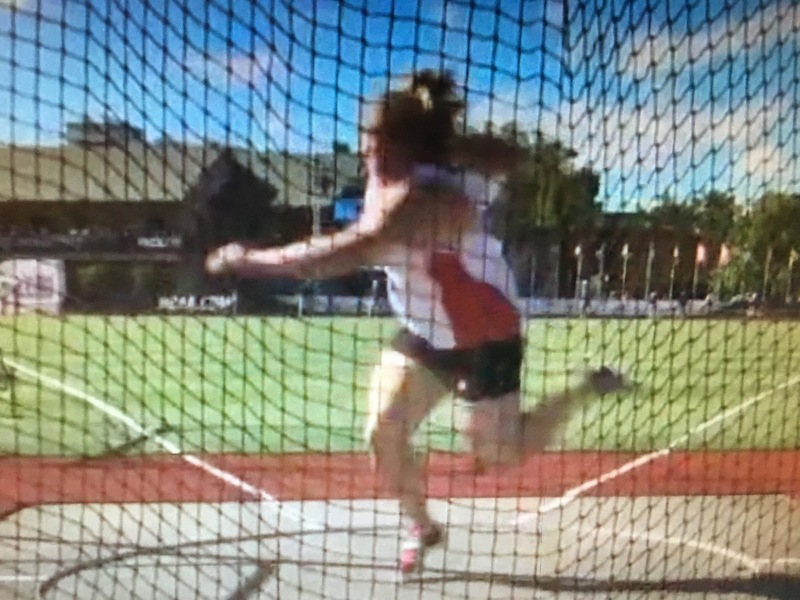 I’ve had several discus throwers that wind back 270 degrees, but they uncoil the wind quite a bit before they start the lower body and sometimes have difficulty shifting the weight from right leg to left leg early. 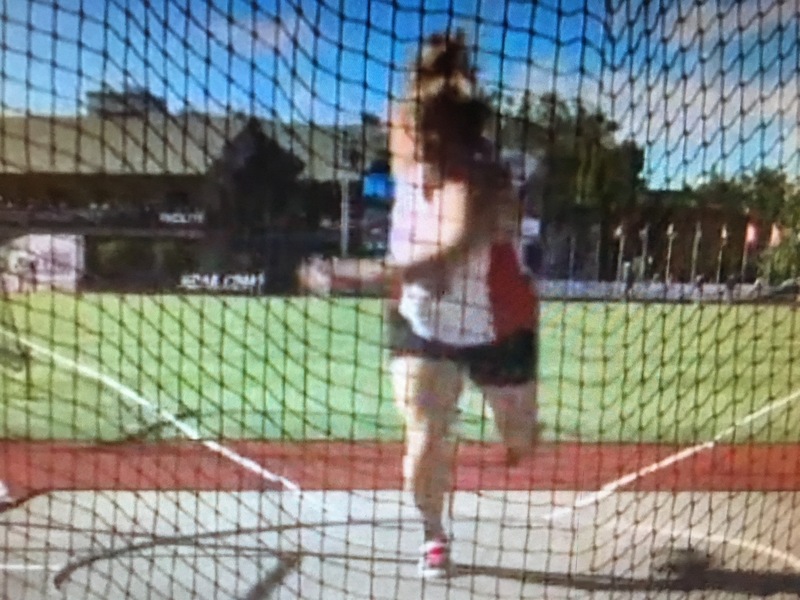 In Kelsey’s wind all we are trying to do is lock the discus back behind the right hip to set up an early shift to the left side. In these two photos we see Kelsey getting set up to run the ring. What do you emphasize in this phase of the throw? First, try to keep the shoulders facing the back of the ring as long as possible. After loading the left, try to turn the left knee and left heel as early as possible. We talk about a feeling of high to low or turning downhill across the ring. Left arm is long, left, and loose. As the discus approaches zero (center back of the ring) we strive to get the right leg as far away from the discus as possible. What is your cue for getting the right foot off the ground? Some say to get it off as early as possible. Others recommend leaving it down until the left foot is turned almost to the direction of the throw. Where are you at with this? I tell my athletes that the left side rotation will pull on the right adductor making your right foot leave the ground. Once the right foot comes off the ground we try to send it out over the back of the ring. Looks like Kelsey did a nice job of (as you said) sending her right foot out over the back of the ring. From here, do you want her driving at all with her left foot/leg? And how would you describe her right leg action as she runs to the middle? The right leg whips around the left leg (axis) with a much radius as possible. I do not cue the left leg drive all that much. I feel if you whip the right leg around and reach to center you naturally end up driving off of the left. The other thing I think is important is to carry your toes under your right knee as early as possible to avoid a soccer style right leg. Here we see Kelsey sprinting to the center of the ring. Can you talk about her right foot action, the orbit of the disc, and anything else you emphasize regarding this phase of the throw? 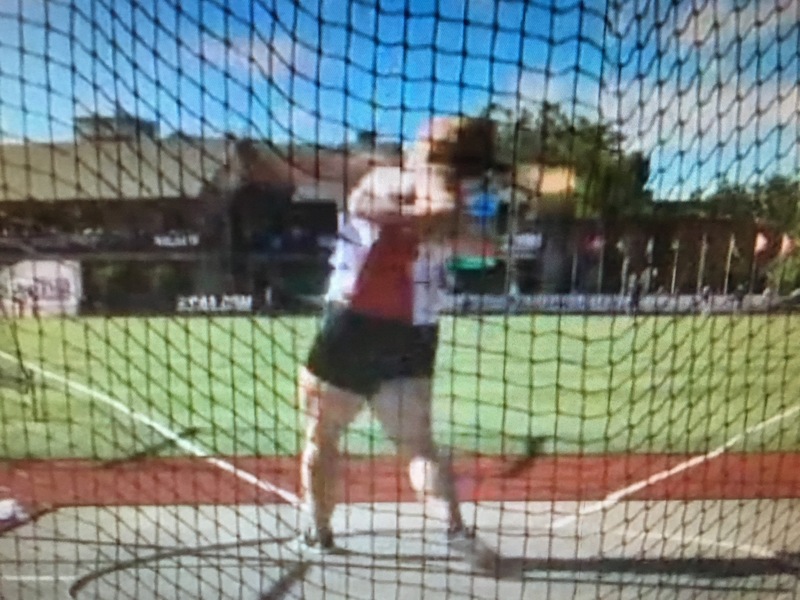 She does an amazing job here of keeping her right leg loaded while driving her right knee and hip into the throw. How did you train her to do that? Let’s talk about my favorite part of her technique: her fixed feet finish. I’m a big fan of fixed feet throwing. But tell me, how did a rotational shot putter end up with a German style non-reverse finish in the disc? There are a couple things that led to the fixed feet finish. 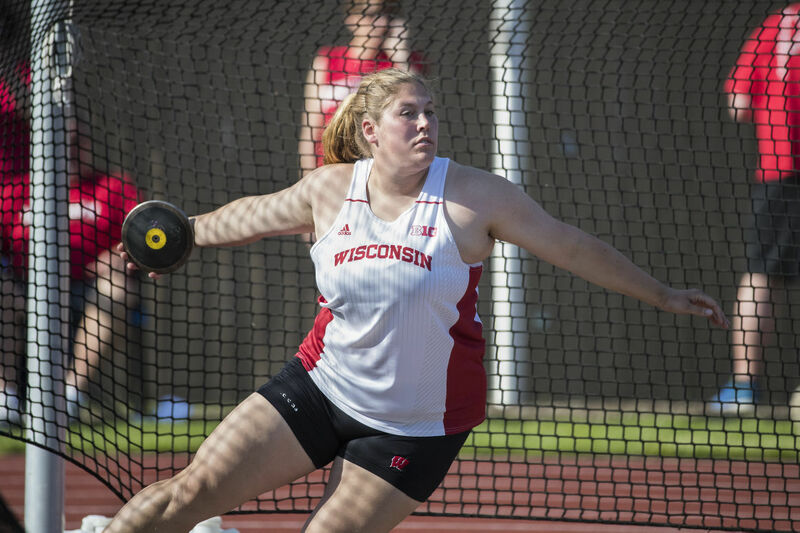 First, when Kelsey arrived at Wisconsin she had what I called a jump-turn finish in the discus, meaning at left foot touchdown she would jump in the air and rotate to throw. I wanted to change this immediately so Kelsey went on a heavy diet of non-reverse throws. 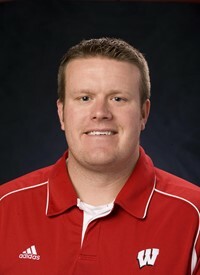 Generally at Wisconsin 60% of our throws in training are non-reverse efforts. Kelsey was closer to 90% in years one and two. Second, Kelsey came in as a glide shot putter and while we were switching to rotational shot her sophomore season almost all of our training throws in the shot were non-reverse throws because it just gave her a better feel for the throw. With the mass amounts of non-reverse efforts in both shot and discus the technique became second nature to her. 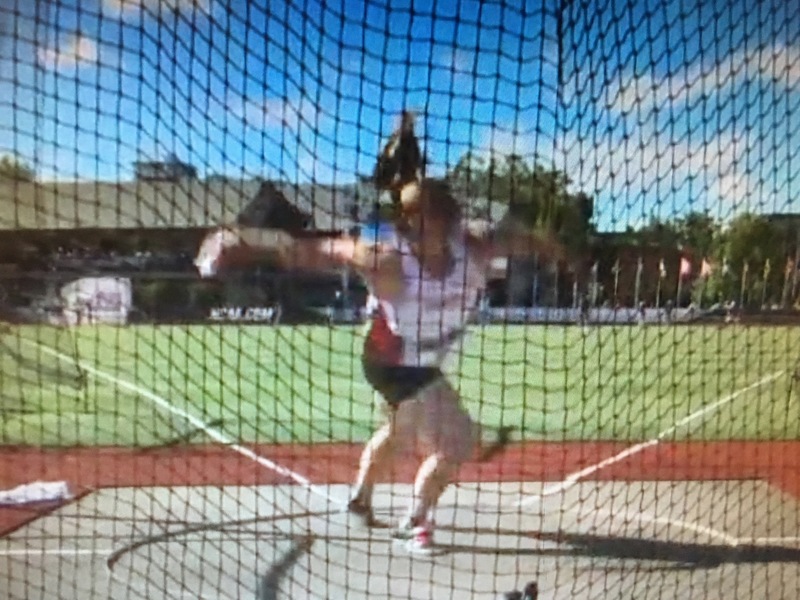 Now, most of my women are developing into or have become non-reverse discus throwers. I had a chance to speak with Robert Harting’s coach a couple of years ago, and he emphasized pushing the right knee/hip out then sweeping the disc out and around the hip. The left leg blocks with a slight bend in it to allow the thrower to keep his/her hand on the disc longer while chasing it out. Do you use similar cues? It looks to me like Kelsey would fit in quite well at the German Championships. I teach the same as you mentioned. When the left foot touches down in the power position Kelsey is trying to push her lower half out to the left. I think this is an easier way to make sure the athlete is more patient with the upper body. If an athlete tries to turn to the right side to the sector (instead of pushing the knee left and the throwing arm left) then it usually ends up with an early or rushed delivery. In the photo you can see Kelsey’s head tilted slightly to the right sector line. This is something she does to ensure maximum radius through the delivery. As I mentioned earlier the pull starts out strong with the lower half and increases velocity, concluding with all energy going into a violent release. If you follow the sport of throwing, you know by now that Gwen Berry, who in May set an American record in the hammer with a throw of 76.31m, has received a three-month suspension from USADA for “declared or admitted use of a prohibited substance.” Fortunately for Gwen, the suspension will end in time for her to compete in the Olympic Trials. Unfortunately, she will be stripped of her USA Indoors title in the weight throw and her record toss in the hammer. She will also lose $30,000 in prize money and performance bonuses that she had earned so far this year. Gwen competed collegiately for John Smith at Southern Illinois University, and planned to stay in Smith’s training group after graduation as she pursued her dream of competing in the Olympics. When Coach Smith took a job at the University of Mississippi last summer, Gwen followed him to Oxford. Gwen had suffered from asthma much of her life, and the Mississippi weather aggravated her condition. 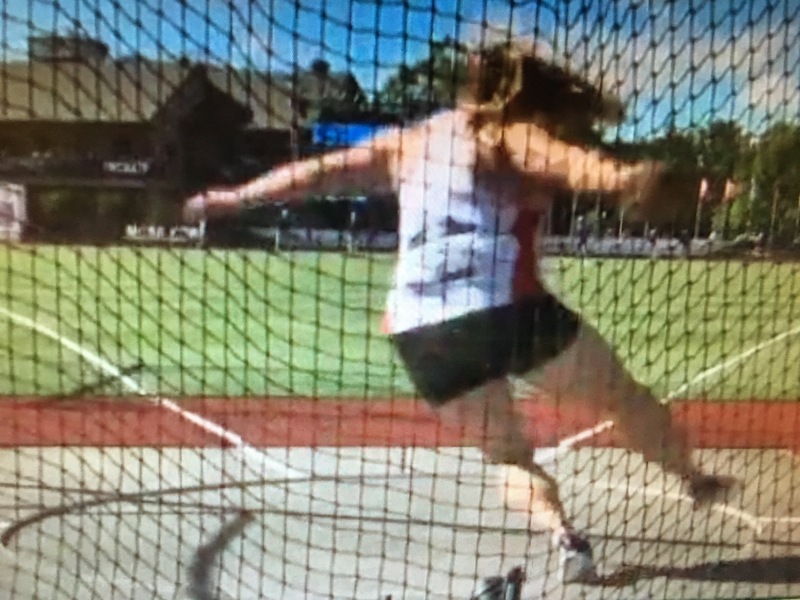 According to Coach Smith, it got to the point last fall that she had trouble making it through more than ten throws per practice due to fatigue and dizziness. Seeking relief, she consulted a doctor who put her on an asthma medication known as Breo. This doctor assured her that Breo contained nothing that could get her banned, that is was essentially the same as another commonly prescribed asthma medication called Symbicort, which is on the WADA list of approved medications. This is where Gwen made a $30,000 mistake. Athletes are ultimately responsible for what they put into their body, and it turns out that Vilanterol Trifenatate, a component of Breo, is not on the WADA approved list. 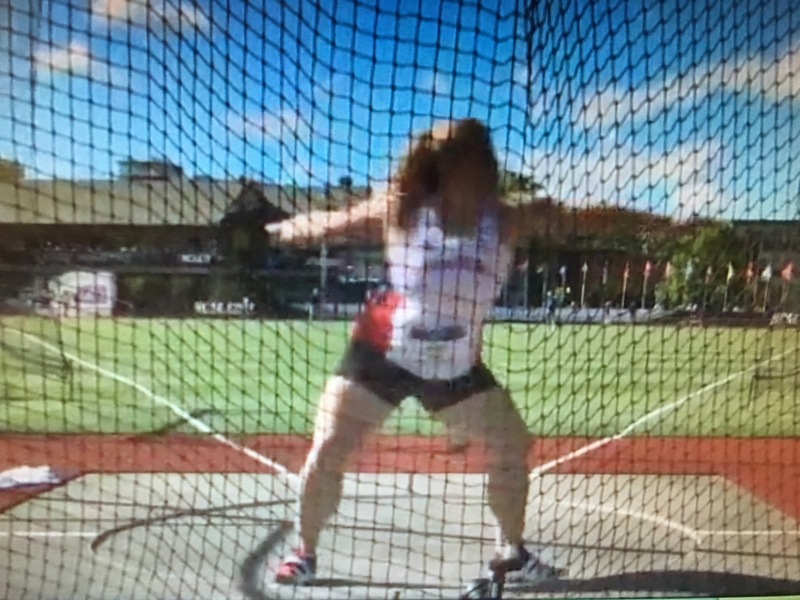 This March, after winning the weight throw at the USATF Indoor Championships, Gwen was drug tested and, per normal procedure, was asked to list any medications that she had recently used. Coach Smith told me that he has always directed his athletes to report any medication they might have ingested, “even aspirin” to demonstrate that they had nothing to hide. Accordingly, Gwen indicated that she had been prescribed Breo. In early May, USADA informed Gwen that she was facing punishment for “declared or admitted use of a prohibited substance.” Nothing had shown up on her tests in Portland, nor in any subsequent tests she was subjected to throughout the spring. Gwen was tested at the meet when she broke the hammer record, and during the 48-hour period afterwards WADA blood-tested her and USADA urine-tested her. All those tests came up negative for prohibited substances. The only reason USADA was aware that Gwen had ingested Vilanterol Trifenatate was because she wrote on the form in Portland that she had taken Breo. There is no Big Book of Drug Sanctions out there that lists exact penalties for each prohibited substance. USADA is meant to consider extenuating circumstances and to assess a punishment appropriate to the specific violation. Step two was to repeat the test after administering a dose of asthma medication. If Gwen’s ability to breathe improved at least 12% on the medication, then USADA would accept the fact that she genuinely needed to take asthma medication. Dr. McEachern found that Gwen’s breathing improved by 54% when on medication. So it was clear that Gwen suffered from asthma and needed to be medicated. Unfortunately, this did not change the fact that the medication Gwen had admitted to using, Breo, was on the prohibited list even though Symbicort, which according to Dr. McEachern is so similar to Breo that “we use them interchangeably” was not. After accepting the fact that Gwen truly needs asthma medication, and that Breo has no more of a “performance enhancing” effect than the approved Symbicort, USADA sanctioned Gwen in a way that would not prevent her competing in the Olympic Trials. Coach Smith says that after an agonizing month spent contemplating the possible end of her career, Gwen is now able to focus again and will be ready when she steps into the ring in Eugene. I have been reading the New York Times for thirty years, and today for the first time in my memory a photo of a hammer thrower appeared in its pages. The occasion? A big article on the Russian doping scandal. When the only publicity the sport of throwing gets is due to a massive doping operation, it is natural for observers of the sport, fans and non-fans alike, to dismiss all the athletes as cheaters. This is especially true when they read that a particular athlete, like Gwen, has been sanctioned for using a prohibited substance with an unfamiliar, impossible to pronounce name. Hopefully, people will take the time to consider the facts of Gwen’s situation and to understand that though she made a mistake in taking Breo (a mistake for which she had paid dearly) she is not a “cheater” or a “doper.” She is a hard-working young athlete of whom we can be proud if we turn on the television this August and see her taking a flag-draped victory lap around the track in Rio.